The NJ Academy of Music is a top-tier training center for serious young musicians. Our unique combination of dedicated, internationally recognized teaching staff, breadth of performance and teaching expertise, and versatility enable us to carve a path that can take students from beginner through advanced, career-oriented caliber of performance. While classical music is one of the most demanding and challenging art forms, music enriches our lives and demands a level of self-discipline, attention to detail, and dedication that can enable all of us to achieve artistic excellence and share meaningful self-expression. At NJAOM, we believe that students of all abilities and levels can be taught to play engaging music through a combination of focused ear training, disciplined practice, and musical education. Through group classes, performance classes, and private instruction, paired with collaborative ensemble studies, students increase self-confidence, gain musical instincts, and learn a true appreciation for music while acquiring performance skills and making musical friendships that will last a lifetime. NJAOM’s students have been prize winners in regional and national competitions and earned recognition at major international competitions. Our students have also been invited to perform with notable U.S. orchestras and have attended pre-professional music festivals. We are proud of our students’ accomplishments and encourage all of our students to strive to exceed their musical goals. Christina Castelli is the only performer of her generation to be awarded two of the world's top prizes both as a solo violinist and as a solo violist. A Laureate of the prestigious Queen Elisabeth International Violin Competition of Brussels and grand prize winner of the William Primrose International Viola Competition, Ms. Castelli has been a featured soloist with ensembles worldwide, including the orchestras of Cleveland, Atlanta, National, Seattle, Colorado, Minnesota, Pittsburgh, New Jersey, and Alabama in the U.S., and the Belgian National Orchestra, National Orchestra of Colombia, and Chilean Regional Philharmonic overseas. As a recitalist, she has appeared on concert series in nearly every major city in the United States, and has been presented in such prominent venues as Carnegie Hall, where she made her critically hailed 2004 recital debut. She has also performed at the Kennedy Center, the United Nations, and in music festivals worldwide. 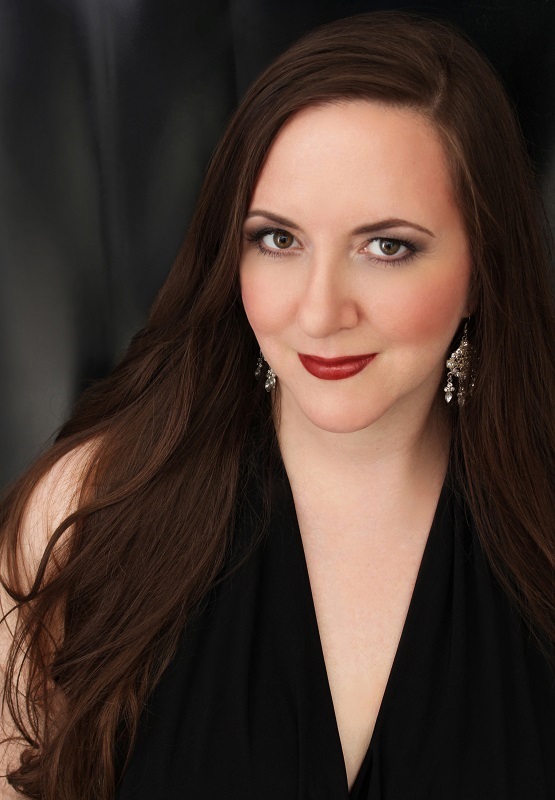 In addition to live performances, Ms. Castelli has been heard as soloist and chamber musician in live concerts and recordings on radio stations around the globe. 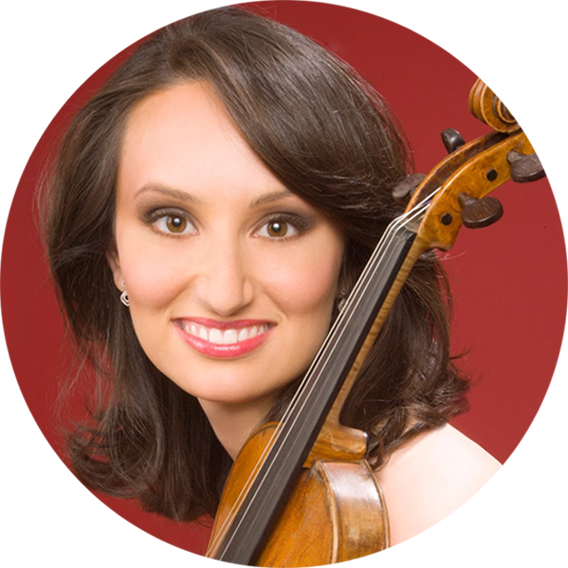 A teacher of award-winning violin students, Ms. Castelli is highly sought after as an instructor of children through a professional level of playing. Some of Ms. Castelli’s students reside in other states and drive or fly in for lessons. Ms. Castelli has taught violin and viola for more than 20 years and has sent students to national and international competitions as well as major summer festivals across the United States. She brings a rare combination of warmth and intensity to her teaching that contributes to her unique style of teaching. Mr. Moffett began his piano studies at age four as a Suzuki student of Virginia Burkhart and pursued additional studies with Theodore Edel and Donald Walker. He earned his master’s degree from The Juilliard School, where he worked with Jerome Lowenthal and studied chamber music with Rohan De Silva. Mr. Moffett holds a bachelor’s degree in biology from Harvard University. John Austin is an active chamber and orchestral performer in the greater NYC area, where he is a member of the Manhattan & Bergen Symphonies. In addition to his classical roots, he has recorded and performed live with numerous folk, jazz, and hip-hop groups. 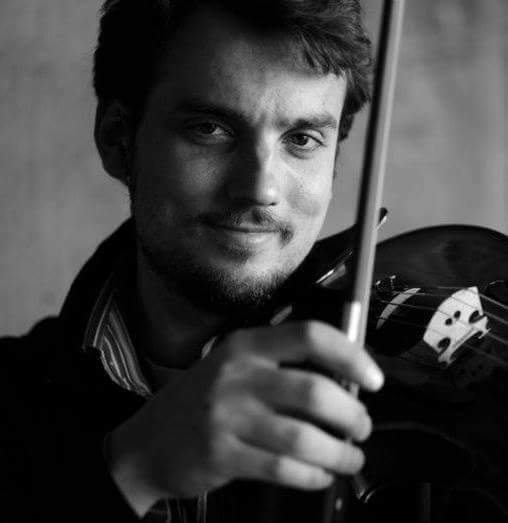 Mr. Austin served as the University of North Carolina School of the Arts viola teaching assistant while pursuing his undergraduate degree in viola performance there. He was also a member of the Asheville and Winston-Salem Symphonies while in North Carolina. In addition to teaching and performing, Mr. Austin is an AmSAT-certified Alexander Technique teacher. He has taught AT lessons and lectured at Columbia and McGill Universities. He was trained at the American Center for the Alexander Technique in Manhattan. A native of Siberia, Grigory Smirnov is an award-winning composer and pianist. His compositions have been performed around the globe in major venues, such as Lincoln Center, Tanglewood, Merkin Concert Hall, Moscow Philharmonic Society and The Copenhagen Opera House. Among his recent works is a large-scale song cycle Dowson Songs, commissioned by The ASCAP Foundation, premiered at Merkin Concert Hall at Kaufman Music Center in New York and to be released on a CD by Naxos. Mr. Smirnov's music has been featured on WQXR, America's leading classical music radio station, and in a number of festivals worldwide, including Tanglewood Music Center (MA, USA), Brevard Music Center (NC, USA), ppIANISSIMO (Sofia, Bulgaria), Chamber Music Sessions (Kiev, Ukraine), CTAM Festival (Moscow, Russia), Blue Lake Summer Arts Festival (MI, USA). Born in Novosibirsk (Russia), Grigory Smirnov studied as a pianist at the Novosibirsk Music College and as a composer with Yuri Yukechev at the Glinka Novosibirsk State Conservatory. During his years in Russia, he was he was awarded a composition prize at the IV Prokofiev International Competition and debuted as a composer of orchestral music with his composition Pastorale which was premiered by the Novosibirsk Philharmonic Orchestra. 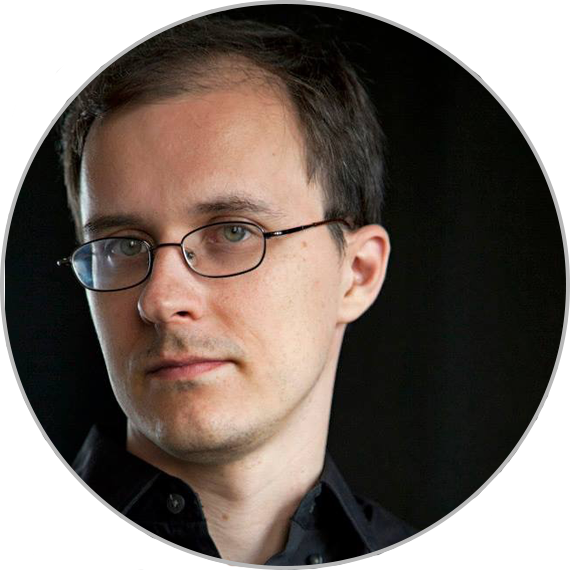 Since moving to the United States, Mr. Smirnov has received his Master of Music degree in composition from The Juilliard School, where he was a full scholarship student under the guidance of Christopher Rouse. His other mentors include John Corigliano, Richard Danielpour and Robert Aldridge. Katsuko (“Kay”) Tsuji is a leading instructor of Suzuki piano pedagogy. Ms. Tsuji was born into a musical family and started her early music training at age 3 at the Yamaha and Suzuki music schools. Her musical passion extended not only to classical music but also Jazz and Latin. Ms. Tsuji earned her bachelor’s degree in music from Osaka College of Music and her master’s degree in music from Mannes College of Music and the Juilliard School, with additional studies at the Aspen Music School, Yamaha Music School, and Suzuki talent education in Japan. As a Suzuki teacher, Ms. Tsuji studied pedagogy with Cathy Hagrave, Jane Reede, Fey Adams, and Joan Krzywicki while being inspired by Nancy Model’s Suzuki/Taubmann approach. She has taken continuing education courses in Suzuki training at the School for Strings under the guidance of Marina Obukvsky. Ms. Tsuji is active member of ASCAP, MTNA, NGPT, MEANJ, and PMTGNJ. Her students range from age two to ninety-nine and she enjoys working with special needs students. 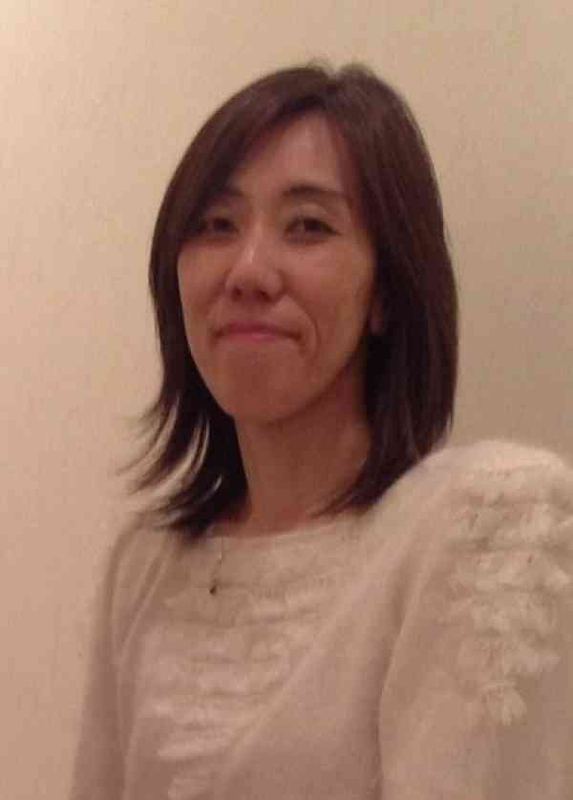 Ms. Tsuji has received numerous teaching awards, including the National Honor Award, Piano Teacher Hall of Fame from American College of Musicians, and the Highest Score Award from ABRSM (Associate Board of Royal School of Music). In addition to teaching, Ms. Tsuji also serves as organist/keyboardist at Paramus Congregational Church, Mission Church, and as a music therapist at Bergen Regional Medical Center. 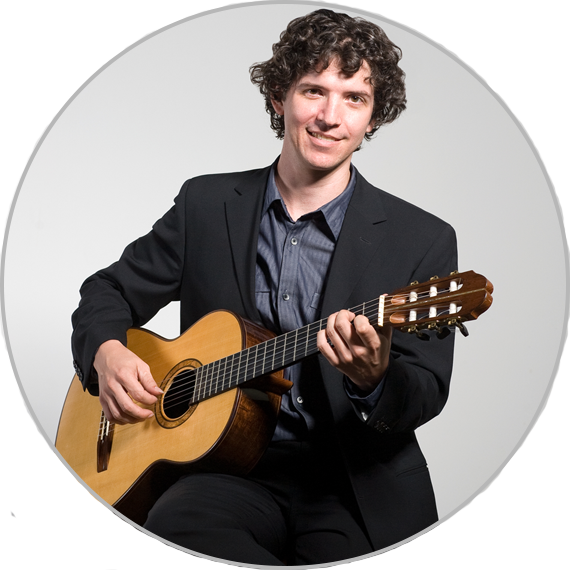 Guitarist Alejandro Cote is a versatile performer who has an extensive repertoire as both a solo and chamber musician. Recent performances include recitals in Atlanta, Austin, Houston and New York City as well as solo and chamber performances throughout the southeastern United States. Additionally, he has performed at Carnegie Hall, Schwartz Hall at Emory University, La Belle Alliance in Curacao, and Cas di Cultura in Aruba. Mr. Cote has been a featured performer at the Amelia Chamber Music Festival, the Madison Chamber Music Festival and the Water Island Chamber Music Festival in the Virgin Islands. Mr. Cote has released two recordings on the Artek label. His debut CD of Spanish music was released in 2008. New Classics said of the recording, “Cote’s accomplished playing is soulful yet always precise and in sympathy with the composers’ intentions. Highly recommended.” In 2012, he released his second album of contemporary American music and received a grant from Emory University to complete the recording and commission a piece specifically for the recording by John Anthony Lennon. Mr. Cote studied at the Manhattan School of Music and at Peabody Conservatory of Music at Johns Hopkins University. His principle teachers were David Leisner and Julian Gray. Cote has taught extensively and has experience teaching all ages and styles, including rock, classical and flamenco guitar. He has taught at Emory University, the Bloomingdale School of Music, and the NY Guitar Academy, and teaches young children in the New York City public schools. Anita Lyons is a sought-after dramatic soprano in the world of opera and classical concerts. Highlights of her recent seasons include her career debuts of Leonore (Fidelio) and the title role of Elektra, both performed at Lincoln Center. Other roles to her credit include Brünnhilde (Götterdämmerung), Santuzza (Cavalleria Rusticana), Giorgetta (Il Tabarro), and Amelia (Un Ballo in Maschera). Ms. Lyons has been seen with Indianapolis Opera, Brevard Music Festival, Boheme Opera NJ, Riverside Opera Company, Columbia University Concert Series, and the Palace Theatre (Stamford, CT). At the age of 17, Ms. Lyons was given the opportunity to perform in the opera chorus of Der Freischütz with the Opera Orchestra of New York at Carnegie Hall. That exciting experience helped inspire Ms. Lyons to pursue a career in opera, and impressed upon her that the experiences we have when we are young can profoundly influence our lives into adulthood. Ms. Lyons holds a Bachelor of Music degree and a Master of Music degree from the prestigious Indiana University Jacobs School of Music. While Ms. Lyons is primarily a classical musician, she has extensive experience teaching students of all ages who sing many different styles of music, including Broadway, Rock, Jazz, and Folk music as well as Classical. Her main goal in teaching is helping students uncover their unique voice and building confidence in their innate abilities. She is also skilled at alleviating tension and discomfort in singing, as well as increasing students' vocal range and volume. 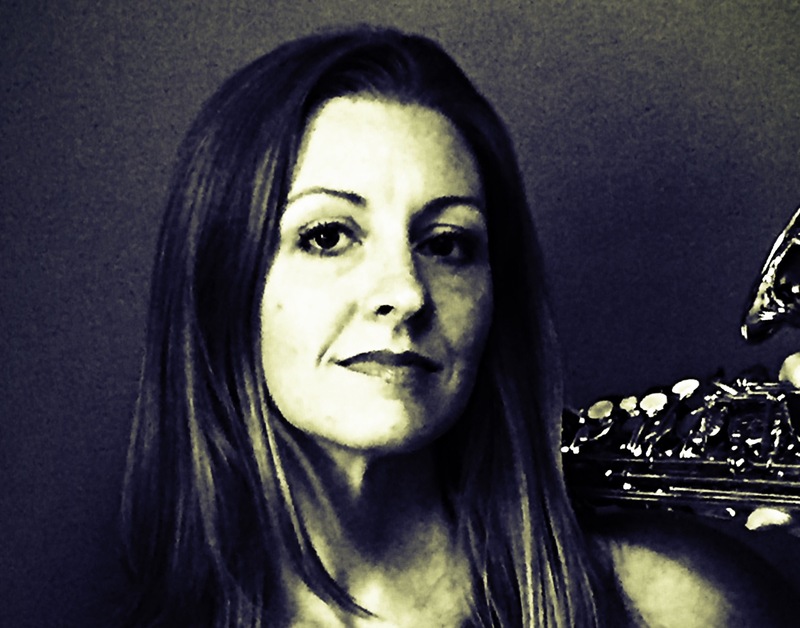 Clarinetist Megan Beaumont enjoys performing as both a soloist and as an orchestra member. She has performed with the American Symphony Orchestra, Hudson Valley Philharmonic, and the Northeastern Pennsylvania Philharmonic, and is also a regular substitute in the pit for Wicked on Broadway. In addition to clarinet, Ms. Beaumont performs and teaches saxophone. Ms. Beaumont holds her Doctorate of Musical Arts degree from Stony Brook University. She earned her Bachelor of Music degree from Indiana University Jacobs School of Music and her Master of Music degree from Florida State University. 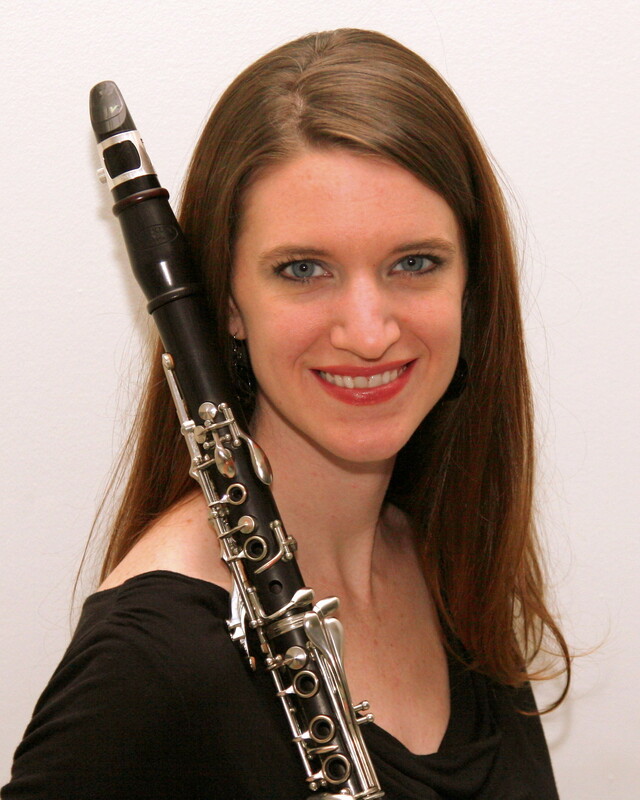 Her primary clarinet teachers include Alan Kay, Frank Kowalsky, Howard Klug, and Eli Eban. In addition to performing, Ms. Beaumont has a strong passion for teaching. In addition to teaching at NJAOM, Ms. Beaumont is on faculty at the Preparatory Division of Bard College Conservatory of Music teaching clarinet, saxophone, and musicianship. She teaches at Bard Summer Music Camps and has served as an adjunct professor at Georgia College and State University, Mercer University, and Wesleyan College in Macon, Georgia, where she taught clarinet lessons and coached chamber music. When not looking for the perfect reed, Ms. Beaumont enjoys coffee, books, and spending time with her husband and son at their home in New Jersey. Saxophonist Jean DiTanna has spent her career promoting and performing contemporary music. Her influences include musicians such as John Coltrane and Gary Louie and composer Christian Lauba. Johns Hopkins University granted her a Provost Research Award to study modern saxophone techniques at the Bordeaux Conservatory in France. Working with composers in France, Ms. DiTanna gave world premieres of Etienne Rolin’s Free Frog Leap, Philippe Laval’s Enfin and American, and Jessica Krash’s Taking Sides in Washington, D.C.
As an active performer, Ms. DiTanna joined the Milligan College Jazz Band as a guest artist and soloist. She played the premier of Book of Proverbs, by Michael Torke, with the Harrisburg Symphony Orchestra. Ms. DiTanna was also invited to perform for Jean-Marie Londiex at the International Saxophone Symposium in Washington, D.C.
Ms. DiTanna began her saxophone studies with Dr. Wayne Pegram at the age of thirteen. She was awarded a merit scholarship to study with Gary Louie at the Peabody Conservatory of the Johns Hopkins University, where she earned her Bachelor of Music degree. Ms. DiTanna then pursued her Master of Music degree, receiving a graduate assistantship and studying with James Houlik, at Duquesne University. Ms. DiTanna has been successfully preparing students for auditions, recitals, and competitions for more than twelve years. Huei-Mei (May) Jhou performed in a variety of music ensembles, orchestras, and chamber ensembles in the United States and Southeast Asia as principal flutist performing varied styles from Baroque to Modern. A proponent of advanced flute performance techniques, Dr. Jhou has presented workshops and master classes, including the Minnesota All-State Band and International Music Camp. Dr. Jhou completed her Doctorate of Music degree at the University of Minnesota and her Master of Music degree at the University of Miami, Frost School of Music, where she received the Frost School of Music scholarship. Her dissertation, Pedagogy of Influential Selected Works by Marcel Moyse: A Modern Perspective, focuses on flute pedagogy and thoughts behind Marcel Moyse’s works and how students could apply modern practice performance tools to master Moyse’s studies and exercises. Dr. Jhou is a recipient of the Suji Lee scholarship from the Taiwanese Association of America. Her principal teachers have included Immanuel Davis, Jim Walker, the late Christine D. Nield-Capote, Linda Nielsen Korducki, Nadine Hur, Jenny Robinson, and Ebonee Thomas. In addition to teaching at NJAOM, Dr. Jhou also teaches at Union County College and Sussex Community College. 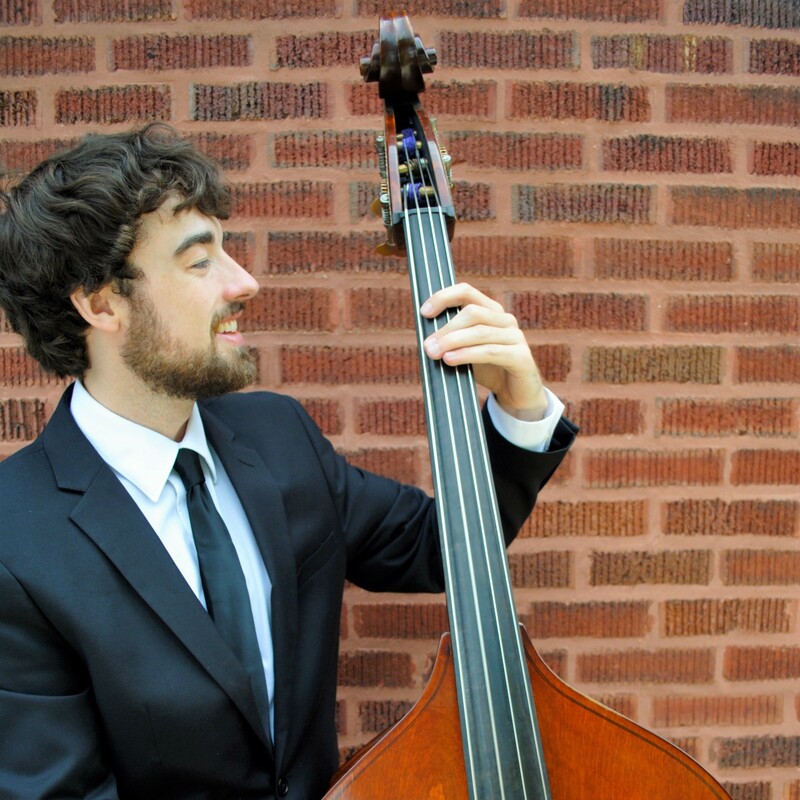 Bassist Sean Francois has been performing throughout the country since the age of nine. He is known as a bassist of great versatility, capable of both solo qualities and the finesse to collaborate within an ensemble. Mr. Francois started his career in the Chicago area where he performed frequently and ran a thriving private studio. He became well known in the area and regularly performed with jazz luminaries such as Bob Ojeda, Ava Logan, and Russ Phillips. He was a finalist in the 2017 Luminarts Jazz Improvisation Competition, hosted by the Union League Club of Chicago. Mr. Francois has studied with world-renowned musicians and educators, including David Baker, Nick Schneider, Mark Bettcher, and Jeremy Allen. He graduated with a Bachelor’s degree in Jazz Studies in Double Bass from Indiana University’s prestigious Jacobs School of Music. Cellist Amali Premawardhana enjoys a career as a classical orchestral and chamber musician. Her performance career has taken her to major concert halls across the United States, Paris, Southern France and Sri Lanka, and to venues such as Carnegie Hall and Lincoln Center with groups such as the the New England Symphonic Ensemble and the Distinguished Concerts International New York Orchestra. In addition to performing, Ms. Premawardhana is an active teacher. A graduate of the Manhattan School of Music, Ms. Premawardhana subsequently pursued Suzuki Cello pedagogy studies at New York School for Strings under the tutelage of Pam Devenport, where she was registered in Books 1-8. Ms. Premawardhana’s primary teachers were Julia Lichten, Margo Tatgenhorst-Drakos, and Tsuyoshi Tsutsumi, and she has received guidance in Indian music from Indian - Dhrupad cellist, Nancy Lesh Kulkarni. She has taken part in festivals such as the Tanglewood Institute, the New York String Orchestra Seminar, the Learnquest Indian Music Conference, the New Directions Cello Festival, San Francisco's Classical Revolution Festival, and has performed frequently with Brooklyn Raga Massive, a leading community of Indian music artists in New York City. Ms. Premawardhana has had the privilege of performing in master classes with extraordinary cellists such as Yo-Yo Ma, Ron Leonard and Matt Haimovitz, in orchestral workshops under the baton of Kurt Masur, and in performances for events hosted by international brands as exciting as Stella Artois. 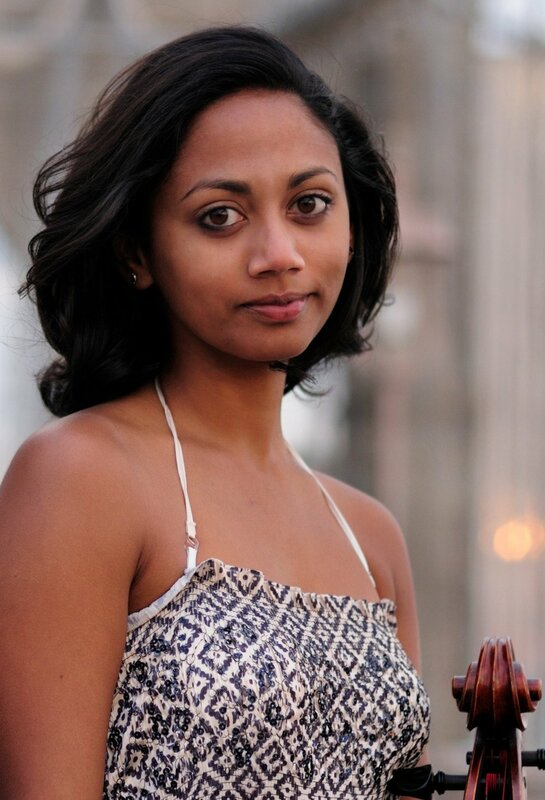 Ms. Premawardhana has performed with the Broadway tour of South Pacific, and has toured with the critically acclaimed Black Rock Coalition Orchestra. A proponent of traditional music, Ms. Premawardhana co-leads her own ensemble, Karavika, which blends Western chamber music with musical traditions of India and Sri Lanka. Karavika has been hailed by the New York Times as a soulful blend of classical and folk traditions and by the San Francisco Classical Voice as commanding performers... suggestive of some of the adventures of such crossover explorers as Edgar Meyer and Yo-Yo Ma. Guitarist PJ Brutzman began to play guitar at age 6 as the result of being inspired by his older brother. Blues became the foundation of his sound, but Mr. Brutzman also became interested in other styles, which he explored in depth during his course of study at the prestigious Berklee College of Music in Boston. 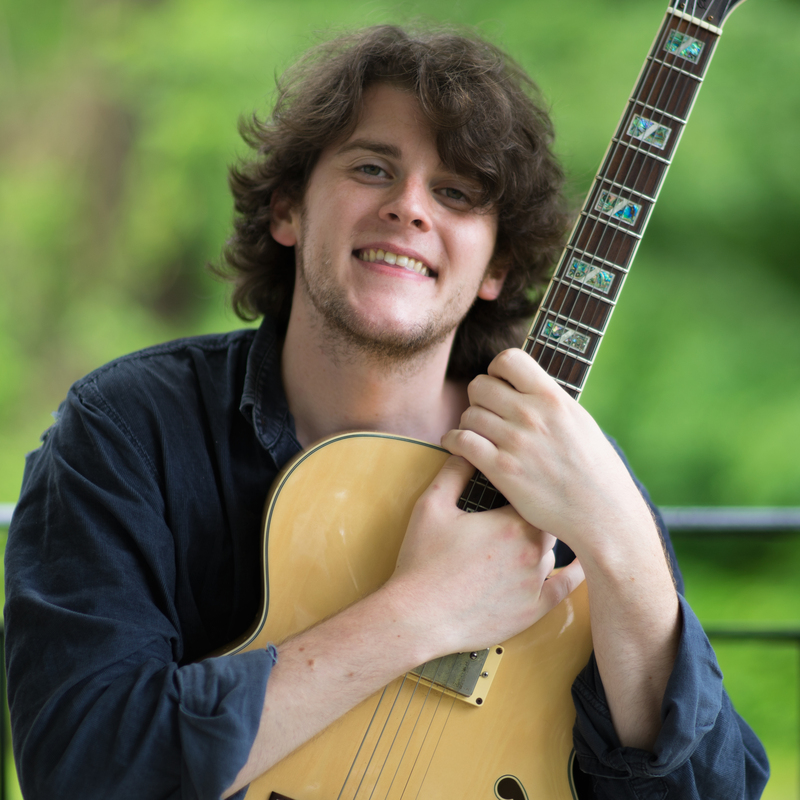 Since earning his BFA in Guitar Performance at Berklee, Mr. Brutzman has actively pursued teaching opportunities as well as performance engagements. Mr. Brutzman's teaching experience spans a multitude of music styles, and he is adept at working with beginners through career-bound students. His focus on fundamentals and stylistic detail, such as modulation, genre-specific techniques, and improvisation, along with a solid classical foundation, enable his students to develop breadth as a musician and collaborator. A master of chromatic harmony, complex phraseology, and polyrhythm, Mr. Brutzman is equally at home teaching the advanced jazz student as well as the beginner classical student. As both a soloist and member of numerous ensembles, Mr. Brutzman has immersed himself in a wide variety of performance opportunities that have ranged from jazz sets to virtuoso solos, and improvisation to score study. His creativity is a reflection of these experiences and allows him to offer a unique perspective in performance and teaching that maintains soulfulness, compassion, and coherence. Eric Mahl is a musician who believes in the transformative powers of music. Under the belief that the study of music is essentially an exploration of the human condition, and that classical music is infinitely beneficial for every human, he strives to cultivate an appreciation and understanding of music played with the highest possible level of artistry. Mr. Mahl’s past positions include assistant conductor to the contemporary music ensemble Orchestre 21, in Montreal QC, and Urban Playground Chamber orchestra in New York City, Conductor of the Fredonia Symphonia, cover conductor for the Orchard Park Symphony in Buffalo, NY, and assistant to all orchestral and operatic activities at SUNY Fredonia, in Fredonia, NY. In addition to NJ Young Artist Ensembles, he also conducts the Western Connecticut Youth Symphony and the Greenwich Village Orchestra and directs the Harmony Program Youth Orchestra North. He has led as guest conductor with the Los Angeles Guitar Quartet, Greenwich Village Orchestra, and Urban Playground orchestra, and the University Orchestras of the College Conservatory of Music (CCM), Orchestra de l’Universite de Montreal, and SUNY Fredonia. Mr. Mahl’s dedication to contemporary music is evident in his many collaborations and commissions with professional and student composers including the world premieres of fully staged operas, experimental ballet, and countless small and large ensemble pieces of all genres. As part of his position with Orchestre 21, Mr. Mahl was selected to act as assistant for the world premiere of Debussy’s newly finished opera, Le Diable dans le Belfroi. He was also selected from over 100 applicants to participate in the Cabrillo Festival of Contemporary music Conducting Workshop, where he worked closely with Marin Alsop and James Ross. Mr. Mahl received his Bachelor of Music degree in Education from Ithaca College and continued his studies both at Universite de Montreal and the State University of New York at Fredonia, where he received his master’s degree. He has studied with some of the foremost conducting pedagogues in the United States, including Marin Alsop, James Ross, Harold Farberman, Neil Varon, Marc Gibson, Larry Rachleff, Don Schleicher, Jean-Francois Rivest, Paolo Bellomia, and Joeseph Gifford. Mr. Mahl’s primary instrument is trumpet, and he continues to perform in orchestral, jazz, and chamber music settings. Pianist Pavel Gintov has been described as “a poet of the keyboard” by Marty Lash of the Illinois Entertainer, a “musical storyteller” by the Japanese publication Shikoku News, and “a fantastic pianist and extraordinary artist” by Jerry Dubins of the Fanfare Magazine. Following his debut at the Kyiv Philharmonic Hall at the age of 12 with Kyiv Chamber Orchestra under the baton of Roman Kofman, Mr. Gintov has been touring throughout Europe, Asia, Africa and the United States, appearing at such stages as Carnegie Hall in New York, Berlin Philharmonic Hall, Teatro Verdi Nationale in Milan, the Great Hall of Moscow Conservatory and Kioi Hall in Tokyo. He has been a soloist with Tokyo Royal Chamber Orchestra, the National Symphony Orchestra of Ukraine, Shizuoka Symphony Orchestra, Orchestra Ensemble Kanazawa, the National Symphony Orchestra of the Dominican Republic and Manhattan Chamber Orchestra under such conductors as Michiyoshi Inoue, Victor Yampolsky, Thomas Sanderling, Volodymyr Sirenko and Tomomi Nishimoto. 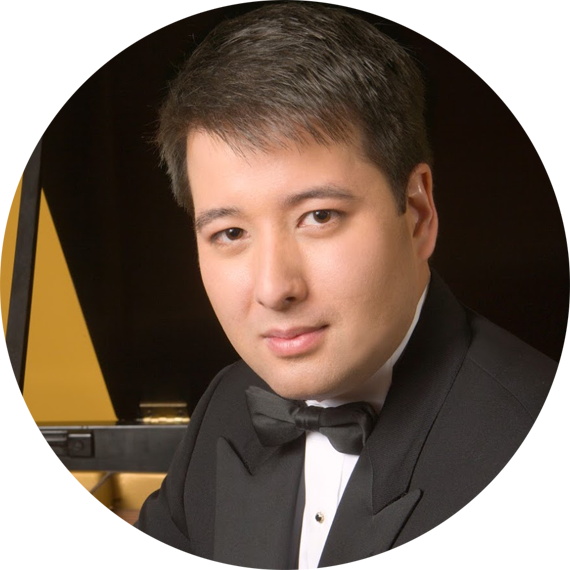 Mr. Gintov has appeared on WFMT radio station of Chicago, WCLV of Cleveland, WPR of Wisconsin as well as numerous radio and TV stations in Europe, Japan, and Ukraine. 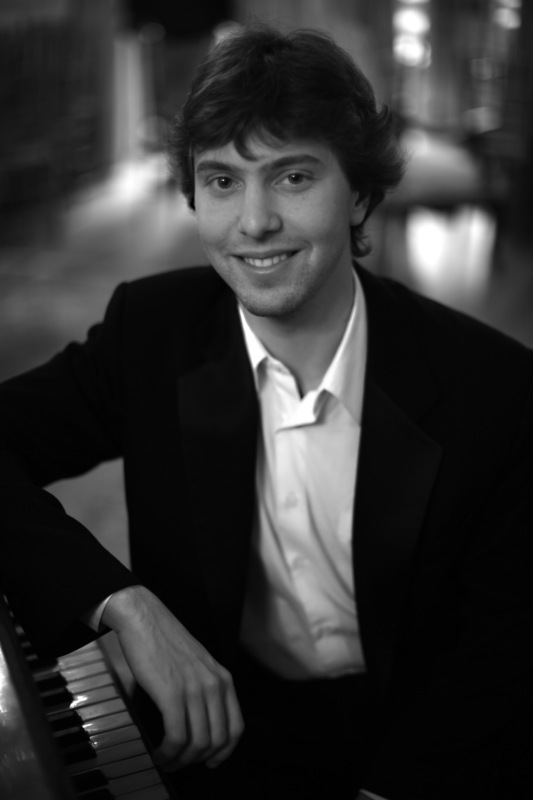 A native of Ukraine, Mr. Gintov won a First Prize in the Premiere Takamatsu International Piano Competition in Japan, where in addition he was awarded four special prizes, First Prize in the 2010 Bradshaw and Buono International Piano Competition and First Prize in The World Competition in 2013. Other prizes include The Bach Prize in the Rina Sala Gallo International Piano Competition in Italy, and the Prize for the Best Performance of Russian Music in the Russian Music International Piano Competition in San Jose, California. An avid chamber music performer, Mr. Gintov has worked with such distinguished musicians as violinists Nina Beilina and Alena Baeva, cellists Yehuda Hanani and Marina Tarasova, tenor Neil Rosenshein, pianist Mykola Suk, woodwind quintet Windscape and many others. He regularly performs together with his sister, violinist Iryna Gintova. Mr. Gintov was awarded the prize for the best collaborative pianist in the International Paganini Violin Competition in Moscow. Mr. Gintov graduated with honors from the Moscow State Conservatory, where he was a student of Lev Naumov and Daniil Kopylov. He holds a Doctor of Musical Art degree from the Manhattan School of Music in New York City, where he studied with Nina Svetlanova. Percussionist John Leister is a versatile performer who is as comfortable in major orchestral performances as with rock bands. Mr. Leister has performed with the American Ballet Theater Orchestra, the Orchestra of St. Lukes, the American Classical Orchestra, the Princeton Symphony, and the Paragon Ragtime Orchestra, as well as with artists ranging from Metallica to Sting and Paul McCartney. 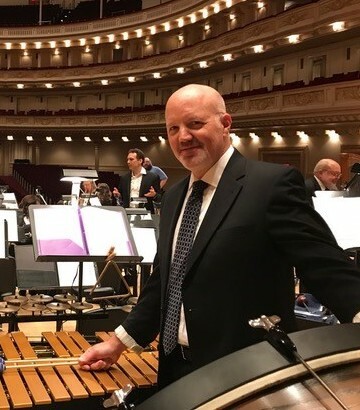 In addition to orchestral and band collaboration, Mr. Leister has also served as a percussion sub for six Broadway musicals. 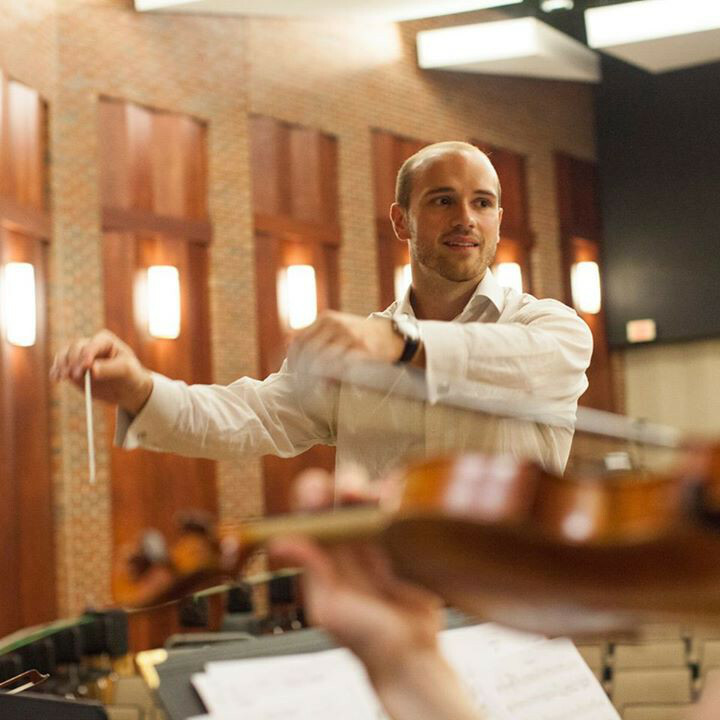 A graduate of The Juilliard School, the University of Illinois, and Rutgers University, Mr. Leister has been presented in performances throughout the United States and Europe. He is a seasoned instructor who has worn many hats throughout his career, including public school band director, arts administrator, and principal, and is currently on the faculty of Montclair Kimberly Academy in addition to NJAOM. He is married and the father of three daughters. 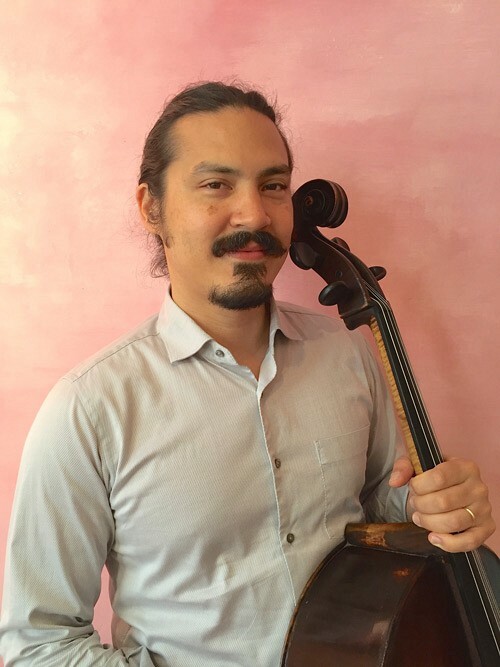 Norwegian-Japanese cellist Egil Rostad received his bachelor's degree in Cello Performance from the Eastman School of Music. He began his Suzuki teacher training at the Colorado Suzuki Institute and completed his full training with Pamela Devenport at the School for Strings. He was awarded the Clifford/Levy Creativity Grant in his final year of study through the Diller-Quaile School of Music. Upon completing his training at the School for Strings, he was invited to join the cello faculty. Mr. Rostad has performed at a variety of venues, including the Joyce Theatre, Carnegie Hall, Merkin Concert Hall, Town Hall, Guggenheim, and MOMA. His performances have appeared on numerous recordings by labels such as EMI, Ajna Records, Compass Records, and Vitamin Records. In addition to performances, Mr. Rostad has composed music for and collaborated in several dance and film productions in New York City. He has performed onstage in Martha Clarke’s acclaimed dance-theater masterwork “The Garden of Earthly Delight,” which made the New York Times Year's Top Ten. With Alvin Ailey II Dance Company, Mr. Rostad performed the Bach Solo Suites; his renditions were described by The New York Times as "vibrant." While residing in Manhattan, Mr. Rostad was on faculty at the School for Strings, the Diller-Quaile School of Music, and the British International School of New York. He now teaches orchestra in the Montgomery Township School District in addition to serving on the faculty of NJAOM. 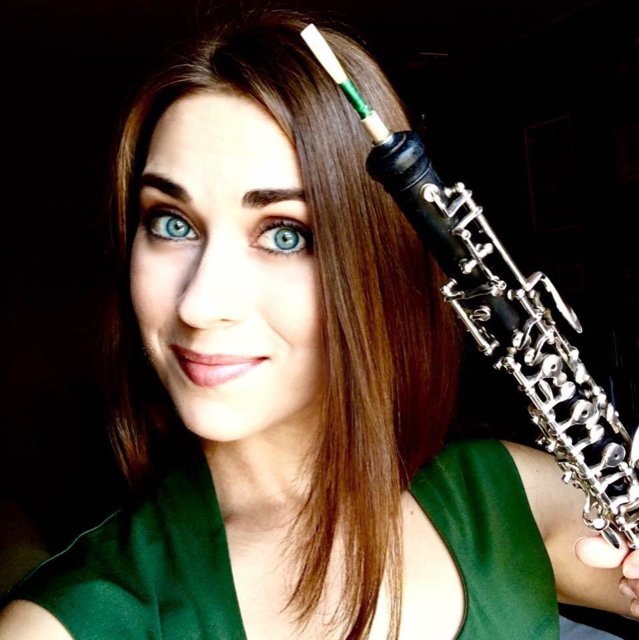 Oboist Marie Trudeau is a diverse, dynamic musician who has performed as a member of numerous symphony orchestras as well as musicals and other stage productions. Dr. Trudeau has collaborated with some of the greatest performers of our time, including Midori, Leonard Slatkin, and Itzhak Perlman. In addition, she serves as principal oboe at Garden State Philharmonic and often acts as principal of the Bay-Atlantic Symphony, Kennett Symphony, Lancaster Symphony, and Reading Symphony Orchestras. She also performs with the South Florida Symphony and Allentown Symphony Orchestras, and has played for Amy Grant with the Richmond Symphony and toured with the Italian tenor trio, il Volo. Dr. Trudeau also plays the two-keyed period instrument, baroque oboe, and serves as the baroque oboist in residence with the Rutgers Baroque Players. As an instructor, Dr. Trudeau is in demand for her teaching style, which involves a collaborative effort with her students to find growth both in musical expression and altruistically. In addition to teaching at NJAOM, she also develops musical courses for and teaches at The Lewis School in Princeton, a school for alternative learning. Seeing each student as an individual with unlimited potential and helping them reach their goals brings inspiration to her own performances. Dr. Trudeau also assists Robert Walters, solo English horn of The Cleveland Orchestra, at Hidden Valley English Horn seminar in Carmel, California. Dr. Trudeau's teaching has extended beyond the United States and has included weeks of instruction abroad, including Italy. Dr. Trudeau earned her doctorate degree with a teaching assistantship in musical arts at Rutgers, where she wrote her dissertation titled “Prokofiev’s Trapeze, Walking the Tightrope between Composing and Culture,” which focuses on Prokofiev’s Quintet for oboe, clarinet, violin, viola, and double bass. The document was also added to the archives at Columbia University in New York City. Previously, she attended the Cleveland Institute of Music (CIM) for her master’s degree and earned her bachelor’s degree in music performance at Michigan State University. Many new works have been written for Dr. Trudeau. These works include “Differential Moods” by Matt Schoendorff, an oboe and piano piece with influences of Nine Inch Nails, and “Happy Hour” by Phil Popham, a piece for a double reed quartet. Maya Artis is a board-certified music therapist who specializes in working with children from the ages of 5 to 18, providing both group and individual sessions. Ms. Artis completed her clinical internship at Mount Sinai Beth Israel in New York City and received her M.A. in music with a concentration in music therapy from Montclair State University. 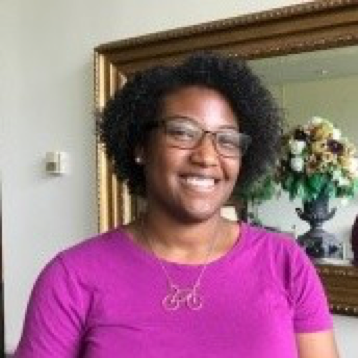 In her current work with children, Ms. Artis incorporates both musical play and improvisation, and her work is informed by a client-centered approach. Although her primary instruments are the piano and the guitar, Ms. Artis also uses a wide selection of musical instruments during her sessions. With each child, Ms. Artis strives to assist in finding new ways of self-expression within the music, in addition to supporting their achievement of goals. 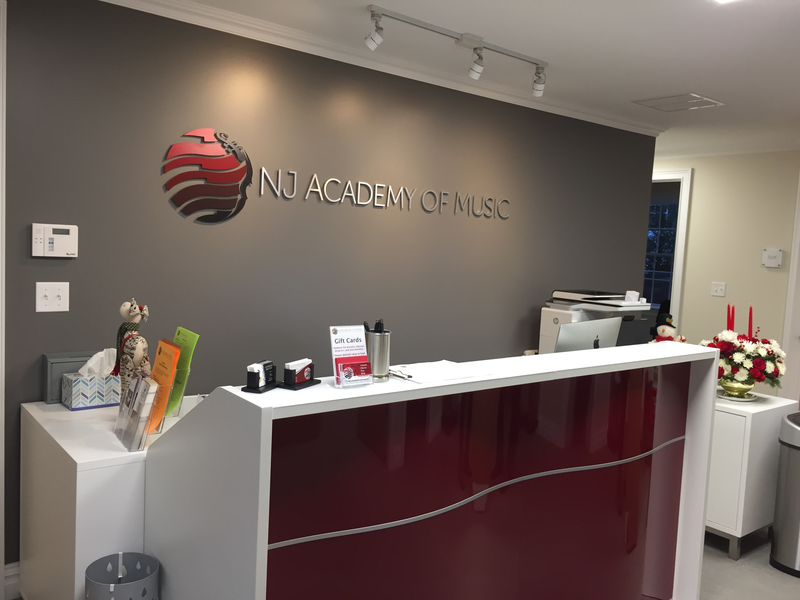 The NJ Academy of Music is excited to share our new academy space with our community.